Up and turned on the heating in the stables so that everyone would be warm at the course which Rachel and Ann were running. 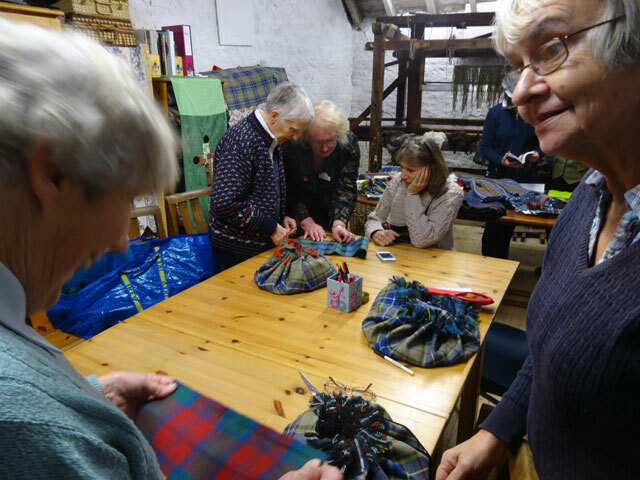 It is an eight-day course run over a number of weeks and it is the fulfilment of a dream for both Ann and Rachel – the opportunity of passing on their skills as craft kilt-makers. Olive has got involved to prepare all of the catering and the hope is that this will be the first of many. I helped park the cars of those who arrived and everyone started their day in the farmhouse drinking coffee, enjoying scones and getting to know each other. Soon they moved over to the Stables to start to learn the theory and practice of kilt-making. I met up with everyone at lunch time (in the farmhouse) and they were clearly having a really good time. Then it was back to work in the Stables until just after four when our guests began to leave for home. It was, everyone agreed, a great start and Ann, Olive and Rachel and very pleased indeed. Tom, David and I spent the day progressing the Bothy. Of course, we didn’t get as much done as we might have hoped because of our peripheral involvement in the course but it was a fun day. Mum went off to her book-reading group in Duns during the day and in the evening she returned to Duns to attend the Duns Church Guild. Cathy, Rachel, Olive, Digger and I enjoyed an evening meal made up of all of the left-overs and then, leaving Cathy to continue her seat upholstery, Rachel and I went off to the Granary where we watched the second part of a Lewis. Unfortunately I had forgotten what happened in the first part, so I quickly fell asleep. I did watch a bit of the News before walking Mix and retiring for the night. It has been a really good day.